White kitchens are design favorites for many homeowners because they complement a wide variety of styles. Not only do they make a cooking space look lighter and brighter, but they also create the illusion of a bigger space. 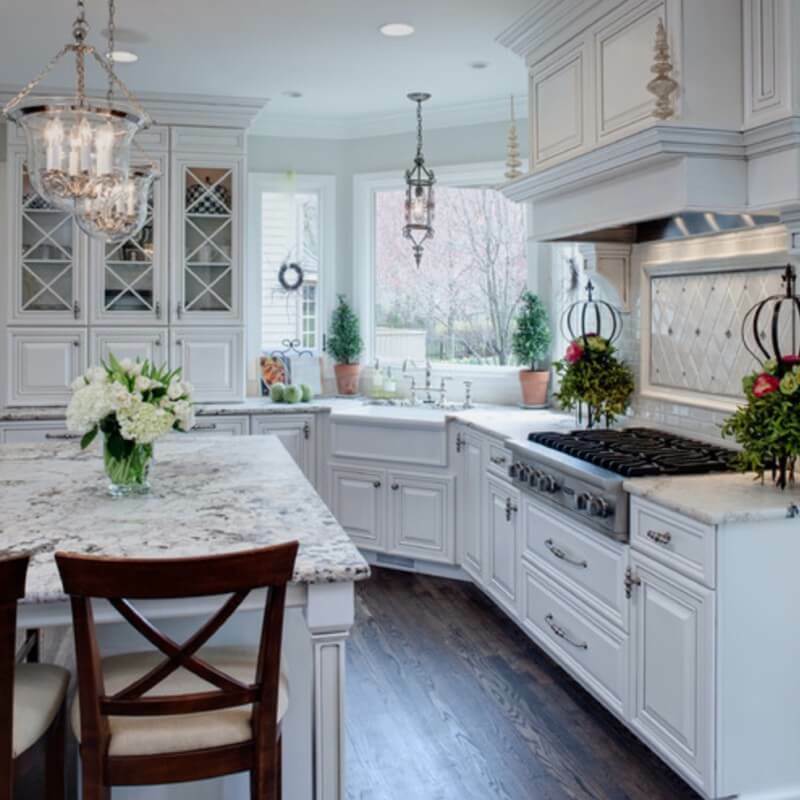 Whether you imagine an all white or mostly white kitchen, you can achieve your dreamy design by implementing the right mix of materials, texture, and pattern. 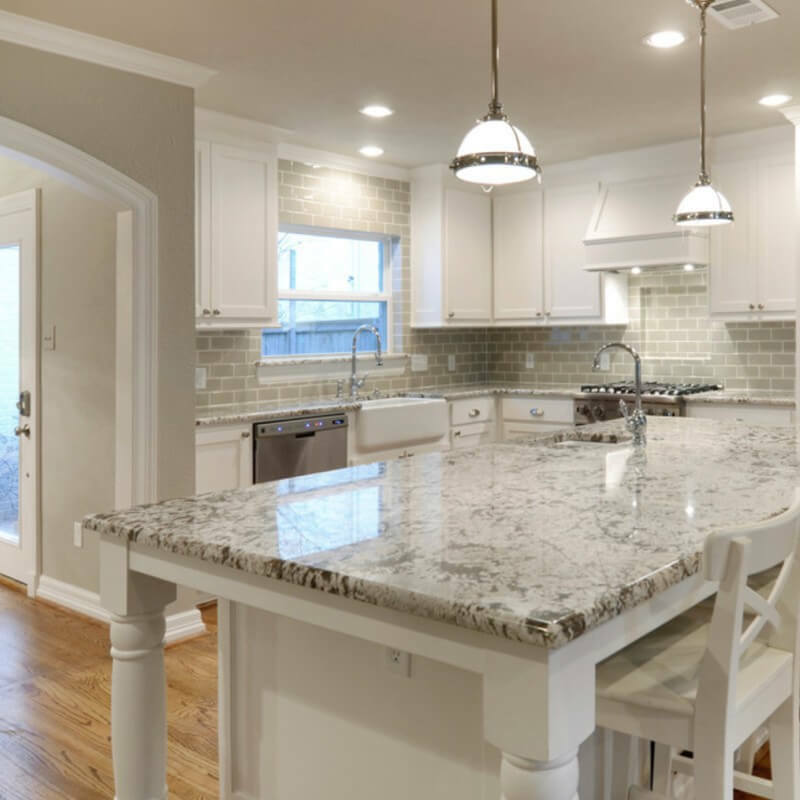 White granite countertops are a sensible and chic choice, offering depth and character for a clean looking design that’s both inviting and absolutely heavenly. They also offer the durability and easy stone care and maintenance you want for the heart of your home. 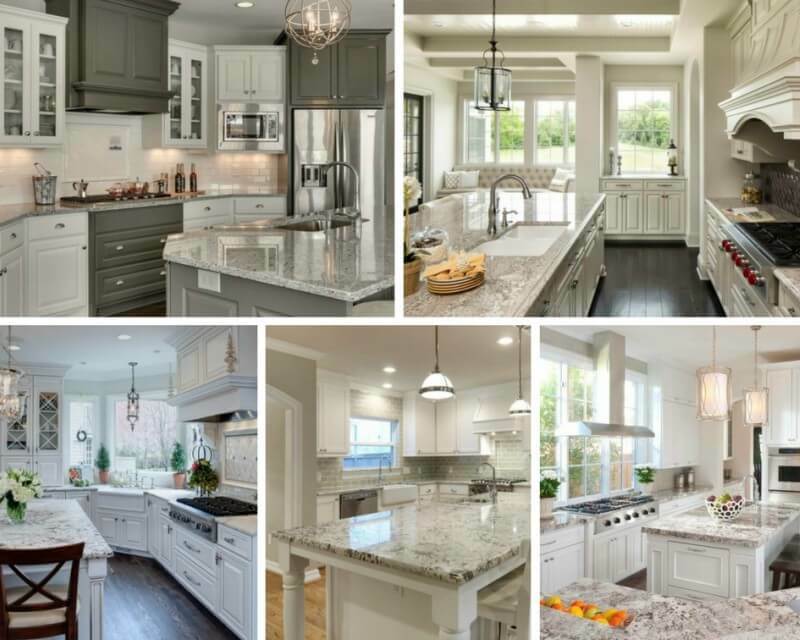 For some divine inspiration, take a look at these thoughtfully constructed kitchens featuring some of our favorite white granite counters. 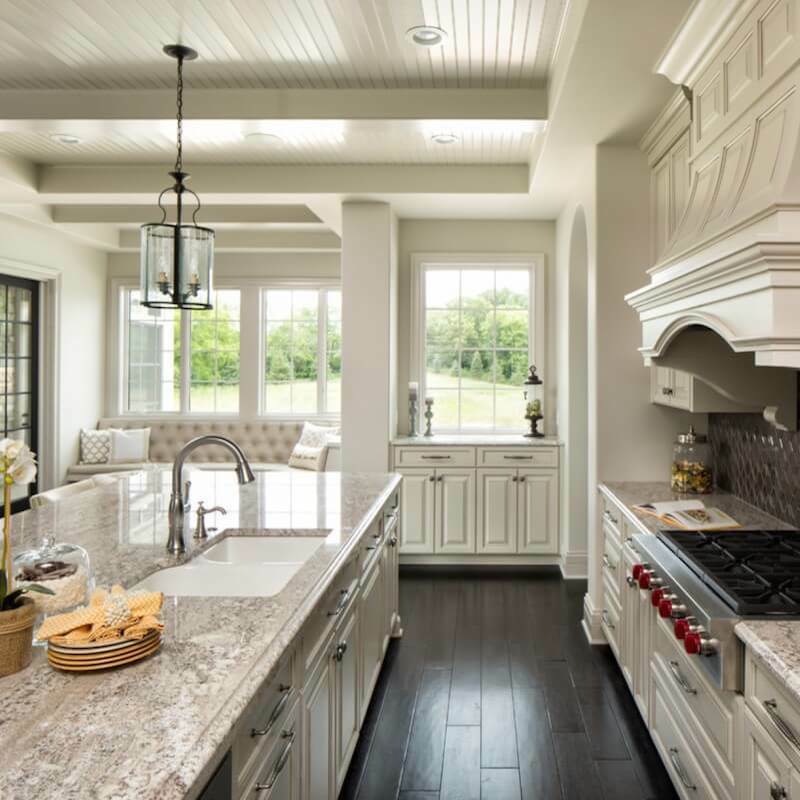 This timeless kitchen features beautifully designed white cabinetry and a stunning hood range that draws the eye up toward a classic coffered ceiling. 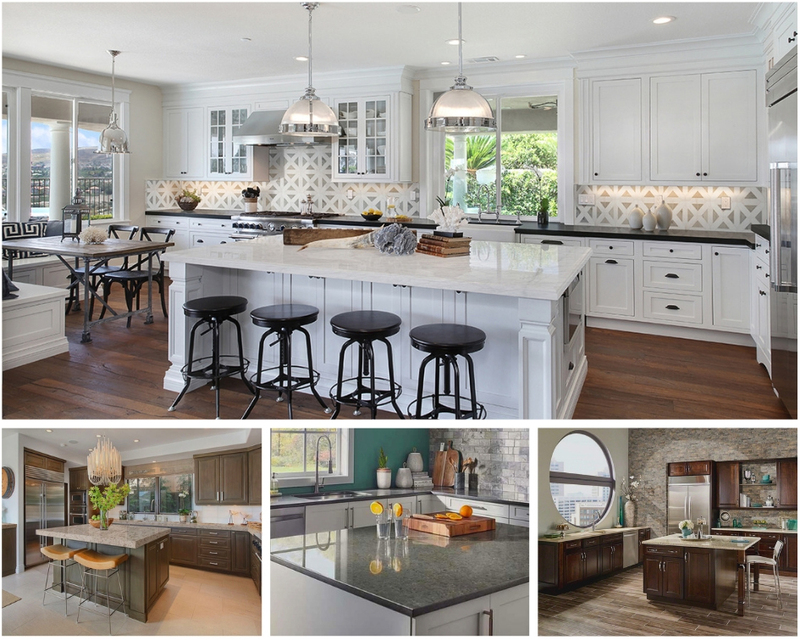 It also incorporates current trends like a large, dark gray island with Jasmine White Granite counters. The white and mid-tone gray stone from India adds subtle interest without overpowering the airy design. 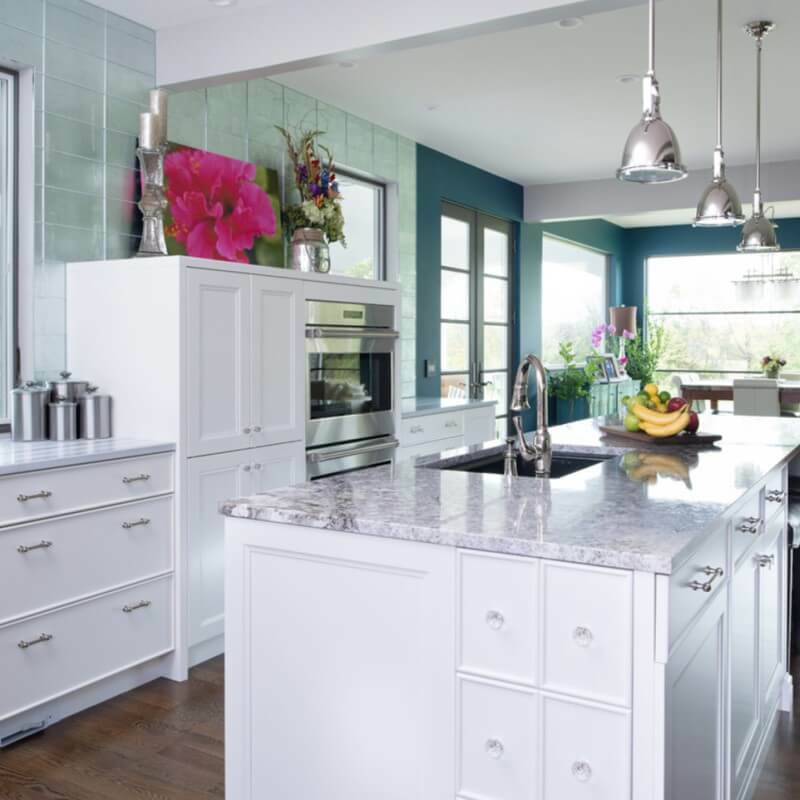 If you mix white cabinets with soft colored countertops and shiny stainless steel and chrome fixtures, any other colors you add will really pop! This kitchen looks even brighter thanks to the flood of natural light and contrasting rich wood floors, shimmery wall-to-ceiling glass backsplash, and teal dining room walls. The White Valley Granite from Brazil lends this eye-catching space extra elegance with its soft white background and dramatic gray veins. 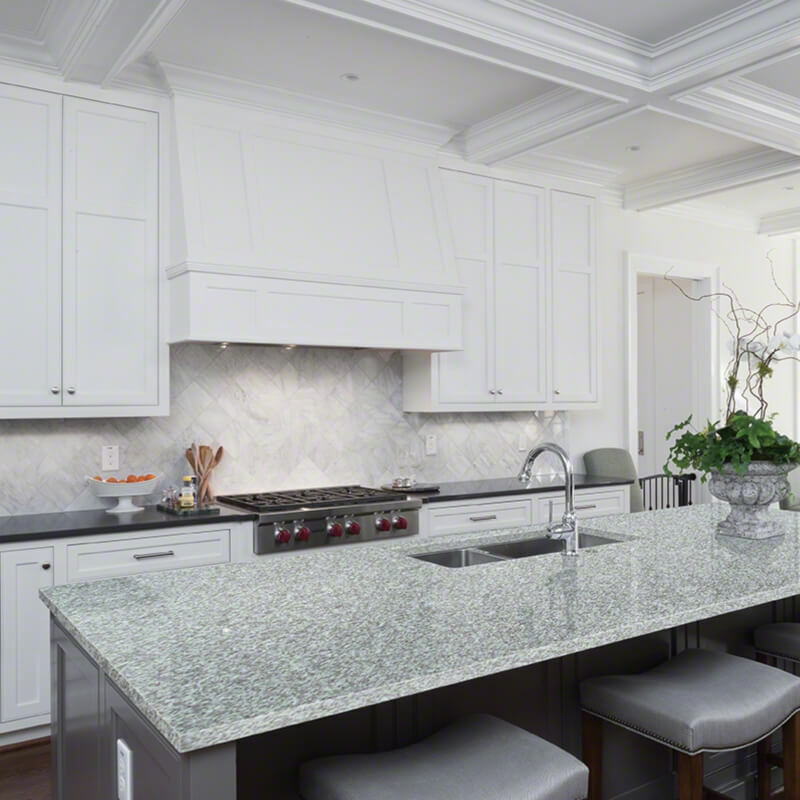 Choosing marble-look granite countertops for white kitchens will give your space an upscale look. If bright white doesn’t quite fit your style, then opt for warm creamy. This monochromatic kitchen is beautifully bathed in beiges and off-whites with hints of rich dark browns and bronzes. These White Supreme Granite countertops from Brazil are in perfect harmony with the detailed cabinetry. The white, beige, and cool gray swirls give this large, neutral kitchen the right balance of pattern. Ooh la la! 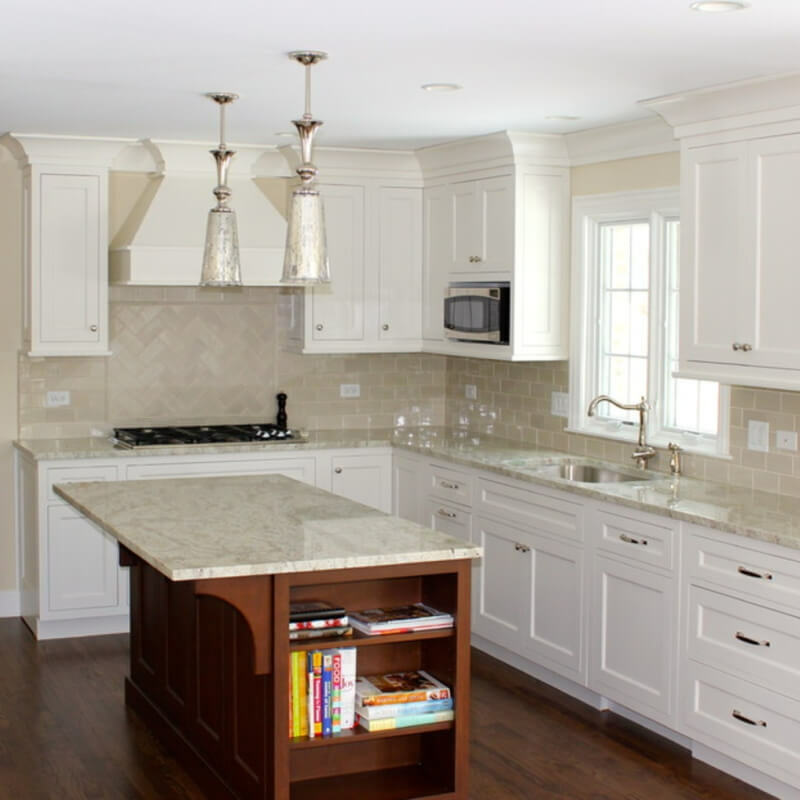 This dainty design features white cabinetry with thick crown molding, as well as a fabulous hood range. The beige backsplash blends in beautifully with the Andromeda White Granite. Its creamy white background with cool gray veins and mahogany onyx speckles defines this natural stone from Sri Lanka. The center island, with a wood tone similar to the floors, highlights the beautiful slab and calls attention to the magnificent mercury glass pendants. Cool pendants, classic subway tile, bin pull hardware, and farmhouse sink are perfect throwback details featured in this kitchen. However, with its clean, modern lines, Bianco Antico Granite from Brazil isn’t a blast from the past. The soft gray background with warm taupe and pink flecks gives the kitchen a more traditional look, as do the turned legs on the island. This focal point is the perfect spot for completing homework or prepping homemade meals, especially with that second sink! 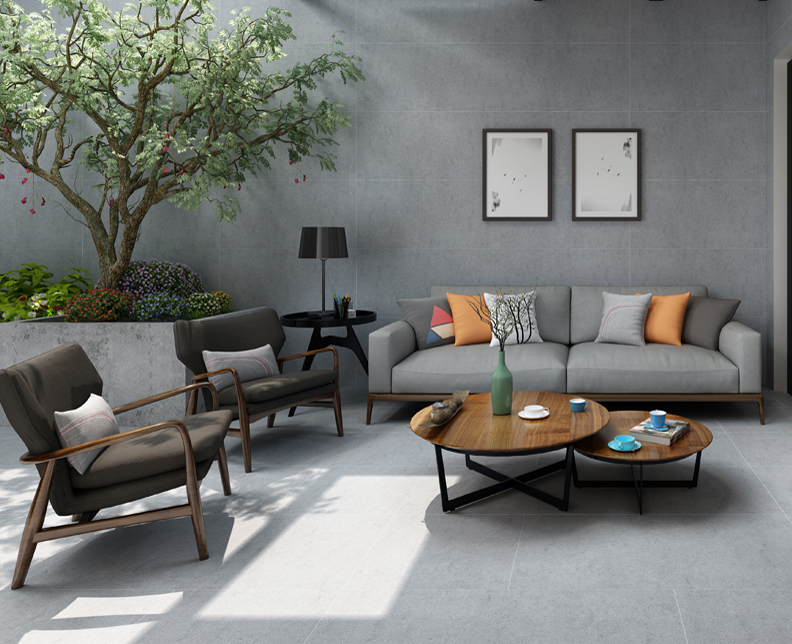 A white and gray color palette just screams sophistication! This elegant design breaks up all the white with dark gray cabinetry, a unique surprise that draws attention to the stovetop and contrasting light gray island. Siberian White Granite was the perfect choice for this luxurious space because it’s a blend of the three featured tones. The cookies-and-cream countertop from India is a fabulous fusion of cottony whites, pale grays, and coal-black specks. 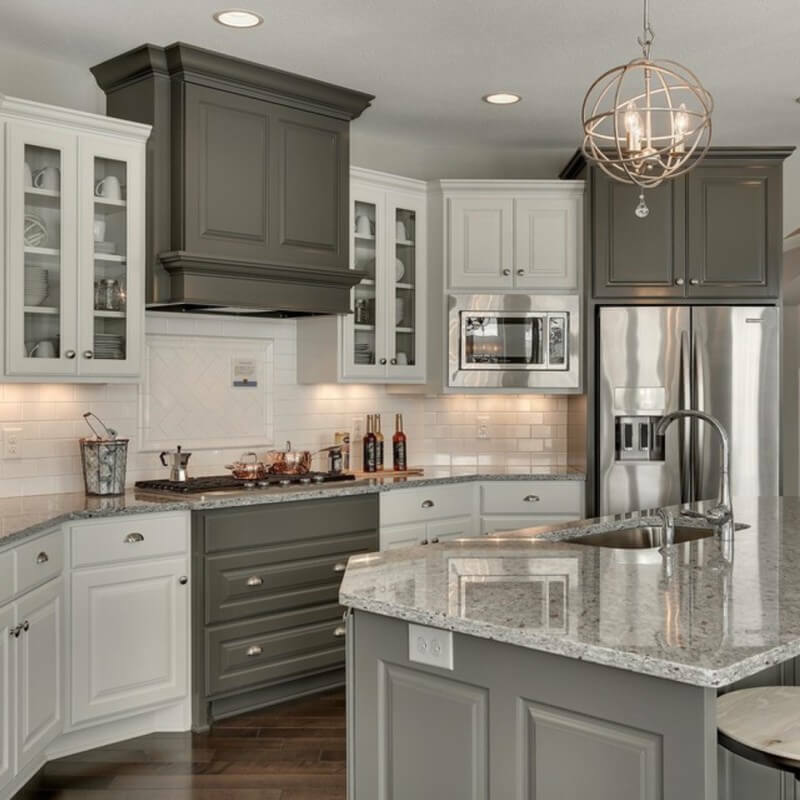 This beautifully appointed kitchen is perfectly detailed, from the X-crossed glass front cabinetry to the finials on the hood range and light fixtures. The pairing of dark wood floors and snowy white countertops offers warmth and a homey feel to the design. Imported from Brazil, Snowfall Granite is a natural granite with flecks of ebony and charcoal and clouds of tawny, warm fawn. While not your typical contemporary design, this kitchen incorporates fashionable features. Modern light fixtures, stainless steel appliances, and a show-stopping hood range with a sleek design that doesn’t obstruct the outdoor view—all these details keep the design grounded in the present. The Winter White Granite from Namibia provides contrast and makes the room look spacious, bright and breezy. The cool-toned frosty white, storm gray, and onyx tie together the stainless elements and dark wood stools and floors. 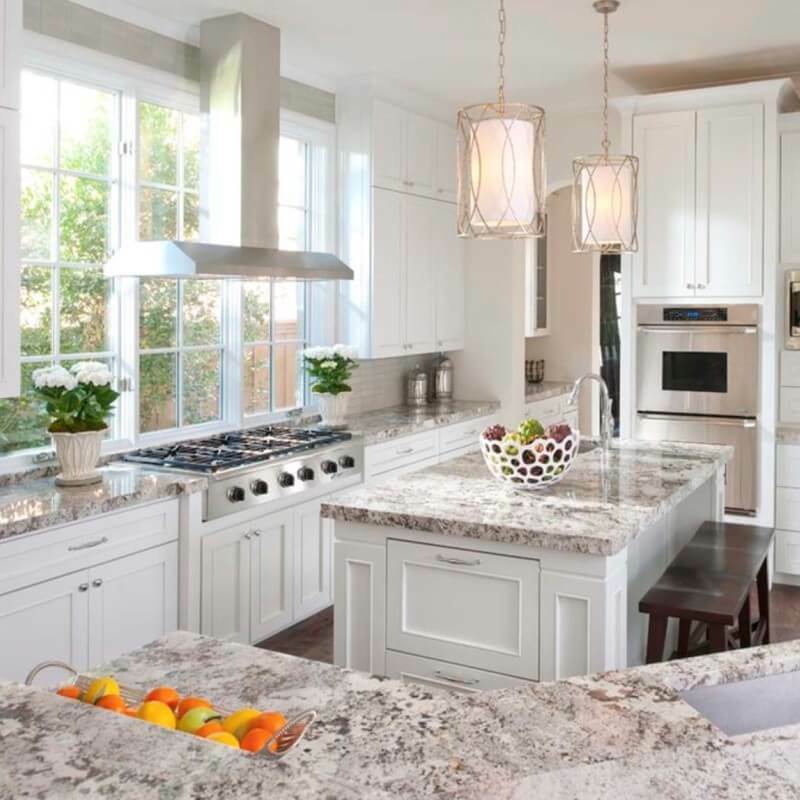 Tips from the Trade: Are Quartzite Countertops Natural or Man-made? Mosaic Monday: Is Glass Tile a Good Idea for Shower Walls? Tips from the Trade: What Affects the Cost of Marble Countertops? Tips from the Trade: Why Does the Cost of Marble Countertops Vary? Tips from the Trade: Do You Need to Seal Outdoor Stacked Stone? 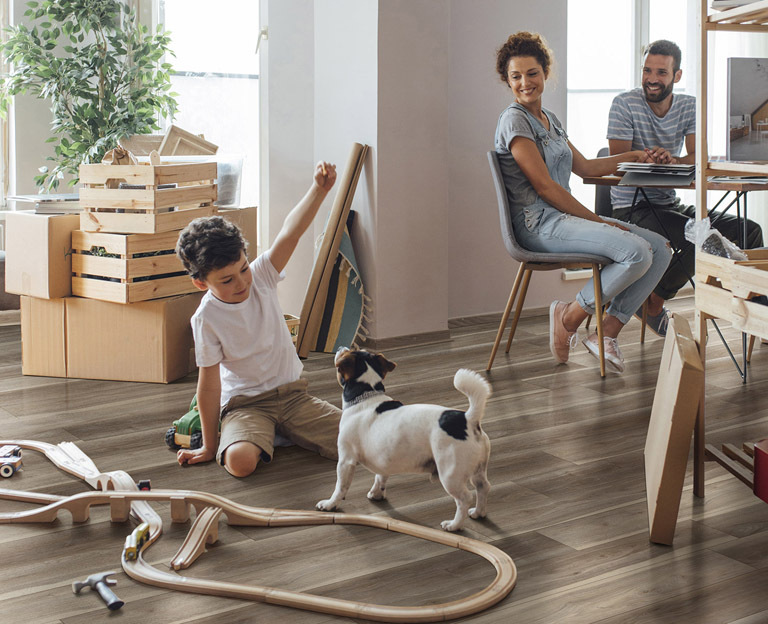 Tips from the Trade: Can You Use Ceramic Tile for Floor Tile?